Equity markets were quiet last week but still made enough noise to reach a new record close. 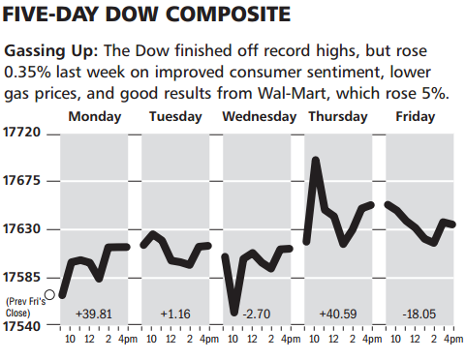 The S&P 500 ended the week up 0.38% and the Dow Jones Industrial average rose roughly the same amount. The S&P 500 is now up more than 10% year-to-date, thanks almost entirely to the rally since mid-October. This rapid ascent is enough to give anyone “the bends,” but the domestic economy continues posting improving data points, and at less than 16 times next year’s projected earnings the broader market hardly feels lofty. Oil prices continued sliding last week. Crude fell 4% to approximately $75 per barrel on news of a jump in domestic production. The fall caps off a 14% decline since midyear. The debate rages on as to whether lower oil prices are a net benefit or net drag to the U.S. economy. Typically, a decline is a boon for U.S. consumers, but given the shale revolution over the past few years a fall in prices will have an increasing drag on GDP growth. Last week, those arguing a net benefit scored an early lead. October retail sales were reported where a 0.3% rise over the prior month beat expectations. Year-over-year, retail sales grew better than 4%. Importantly, the report looked impressive any way you slice it. 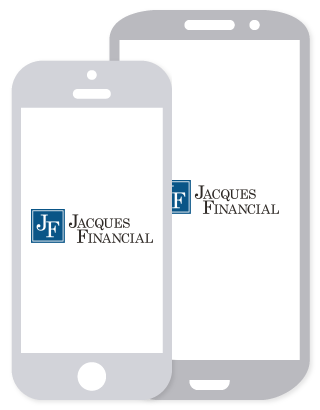 Gains were broad-based with the exception of electronics, which fell 1.6% month-to-month. Additionally, one of the world’s largest discount retailers reported surprising quarterly results and cited lower gas sales as a driver to higher average purchases. Round two of this continued debate should play out this week with several retailers reporting quarterly results. While investor attention has focused on rising equity and falling oil prices lately, municipal debt has posted an impressive year. The S&P 500 Municipal Bond Index was up 8.3% through the end of October, topping both U.S. Treasuries (4.1%) and highly-rated corporate debt (6.4%). The gains have attracted a lot of capital. 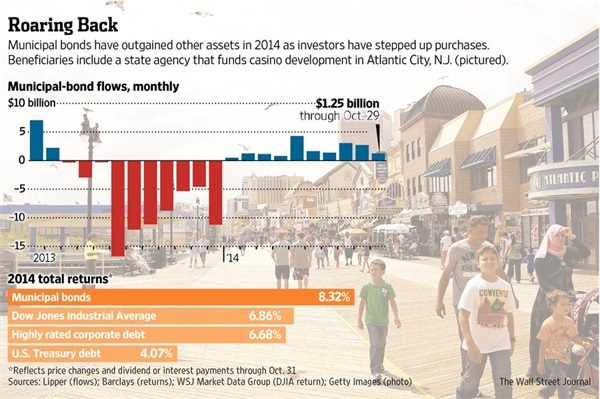 Through October, investors have poured an additional $18.2 billion into the municipal debt market, compared to redeeming roughly $48 billion over the same time period last year. However, investors should tread cautiously. Some of the biggest beneficiaries of the rally have been lower-rated securities. Strong demand has allowed Puerto Rico to issue $3.5 billion of fixed income securities backed by hotel and alcohol revenue, despite restructuring its debt and receiving credit rating downgrades earlier this year. Similarly, Detroit was able issue $1.8 billion of municipal debt in August paying between 3.24-4.5% for a new water and sewer system, despite filing the largest municipal bankruptcy in history just last year. “Big data” is coming of age. The buzzword continues to grow in popularity and this past week, one of the leading developers of the burgeoning field’s open-source platform filed to go public. But what exactly are companies doing with all of this data? Earlier this month Gilt, an online fashion retailer, gave us a glimpse when the company’s data scientist released a report entitled “Stilettos by State.” The team collected, scrubbed and analyzed the average heel height of shoes purchased on its website. 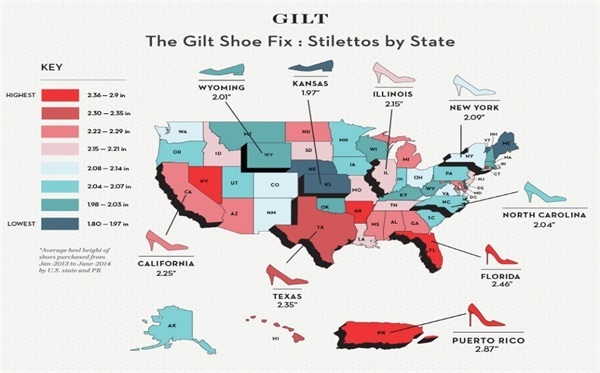 According to Gilt, women from Puerto Rico and Florida order the highest heeled shoes while those in Kansas and Nebraska purchase more flats. Big data no doubt leads to valuable insights for many industries, but do we really need high-powered computers crunching massive amounts of data to tell us that Midwestern women are sensible?